The car features a 6.1-litre 60° BMW S70 V12 engine and it was conceived as an exercise in creating what its designers hoped would be considered the ultimate road car. Only 106 cars were manufactured, 64 of those were street versions (F1), 5 were LMs, 3 were longtail roadcars (GT), 5 prototypes (XP), 28 racecars (GTR), and 1 LM prototype (XP LM). Production began in 1992 and ended in 1998. 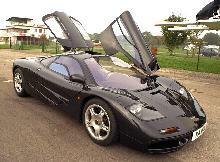 The McLaren F1 was at the time the fastest production car ever built, eclipsing the Jaguar XJ220. A standard version of the McLaren achieved a top speed of 371 km/h (231 mph) in 1994, holding this record for more than 10 years until it was finally eclipsed in 2005 by the Koenigsegg CCR . Chief engineer Gordon Murray's design concept was a common one among designers of high-performance cars: low weight and high power. This was achieved through use of high-tech and expensive materials like carbon fibre, titanium, gold and magnesium. The F1 was one of the first production cars to use a carbon-fibre monocoque. The idea was first conceived when Murray was waiting for a flight home back from the fateful Italian Grand Prix in 1988; Murray drew a sketch of a three seater supercar and proposed it to Ron Dennis, pitched as the idea of creating the ultimate road car, a concept that would be heavily influenced by the Formula One experience and technology of the company and thus reflect that skill and knowledge through the Mclaren F1. Quote from Gordon: "During this time, we were able to visit with Ayrton Senna (the late F1 Champion) and Honda's Tochigi Research Center. The visit related to the fact that at the time, McLaren's F1 Grand Prix cars were using Honda engines. Although it's true I had thought it would have been better to put a larger engine, the moment I drove the Honda NSX, all the benchmark cars--Ferrari, Porsche, Lamborghini--I had been using as references in the development of my car vanished from my mind. Of course the car we would create, the McLaren F1, needed to be faster than the NSX, but the NSX's ride quality and handling would become our new design target. 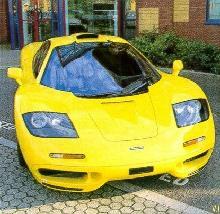 Being a fan of Honda engines, I later went to Honda's Tochigi Research Center on two occasions and requested that they consider building for the McLaren F1 a 4.5 liter V10 or V12. I asked, I tried to persuade them, but in the end could not convince them to do it, and the McLaren F1 ended up equipped with a BMW engine." The final result is a custom-built 6.1 L (6064 cc) 60-degree V12 based on BMW's M70/S2 engine with an aluminium alloy block and head, 86 mm x 87 mm bore/stroke, quad overhead camshafts for maximum flexibility of control over the four valves per cylinder and a chain drive for the camshafts for maximum reliability, the engine is dry sump. At 266 kg, the resulting engine was slightly heavier than Murray's original maximum specification weight of 250 kg but was also considerably more powerful than he had specified. The road version used a compression ratio of 11:1 to produce 627 horsepower (461 kW) at 7400 rpm—considerably more than Murray's specification of 550 horsepower (400 kW). Torque output of 480 ft·lb (651 N·m) at 5600 rpm. Other, more highly tuned, incarnations of the F1 produced up to 692 hp (509 kW). The engine has a red line and rev limiter at 7500 rpm. The engine delivers considerable torque (398 ft·lbf) from a low 1500 RPM. Standard equipment on the stock McLaren F1 includes full cabin air conditioning, SeKurit electric defrost/demist windscreen and side glass, electric window lifts, remote central locking, Kenwood CD stereo system, cabin access release for opening panels, cabin stowage department, four lamp high performance headlight system, rear fog and reversing lights, courtesy lights in all compartments, map reading lights and a Facom titanium tool kit (stored in the car). Airbags are not present in the car. During its pre-production stage, McLaren commissioned Kenwood to create a lightweight car audio system for the car; Kenwood, between 1992 and 1998 used the F1 to promote its products in print advertisements, calendars and brochure covers. Each car audio system was especially designed to tailor to an individual's listening taste and radio was omitted because Murray never listened to the radio. Every standard F1 has a modem which allows customer care to remotely fetch information from the ECU of the car in order to help aid in the event of a failure of the vehicle. The standard McLaren F1 can reach 0 to 60 mph (97 km/h) in 3.2 seconds and has an official top speed of 240.1 mph (386.7 km/h) (although with the rev limiter removed); the F1 remains as of 2007 one of the fastest production cars ever made; as of may 2008 it is only succeeded by the Koenigsegg CCR, the Bugatti Veyron and the SSC Ultimate Aero TT. However, as stated at the head of the article, all of the superior top speed machines exploit forced aspiration to reach their respective top speeds -- making the Mclaren F1 the fastest naturally aspirated production car in the world (as of May 2008). While many car manufacturers often promote their cars in terms of raw engine power, in terms of overall performance (acceleration, braking, and agility) a car's power-to-weight ratio is a better method of quantifying performance than the peak output of the vehicle's powerplant. The F1 achieves 550 hp/ton (403 kW/tonne), or just 4 lb/hp, compare the Enzo Ferrari at 434 hp/ton (314 kW/tonne) (4.6 lb/hp), compare the SSC Ultimate Aero TT with 1003 hp/ton (747.9 kW/tonne), also compare the Bugatti Veyron at 530.2 hp/ton (395 kW/tonne).